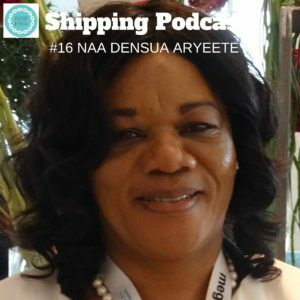 Naa Densua Aryeetey, is the Head of Shippers Service at the Ghana Shippers’ Authority in Accra. She was one of the founders of WISTA Ghana in 2010 and she has now taken on the task of being one of the members of the WISTA International Executive Committee, EXCO, responsible for spreading the word about women in shipping in Africa. Naa is a graduate from the World Maritime University in Malmö, which is where we met for the first time in April 2008, at a gathering for women in the maritime industry, which since then has developed into Maritime Women Global Leadership International Conference (MWGL). I was very surprised the next time I met Naa, at the WISTA International AGM in Paris in 2013, to hear that she had gone back to Ghana and formed a National WISTA Association after our first meeting. Merry Christmas! At the top of my wish list for Christmas is a review on iTunes from you. Thank you for listening!